The Cloud Computing Architecture is a broad and comprehensive modern concept, which includes the possibility to use the cloud to store large amounts of various data and applications, and providing them on demand, it is also the use of storage internet applications, as for example e-mails, it is the seamless access to powerful hardware, servers, storage and software technologies offered by datacenters without embedding significant investment to own infrastructure, software and hardware. Private - cloud which is build and exclusively used by a single organization. Public - cloud hosted by cloud service providers. 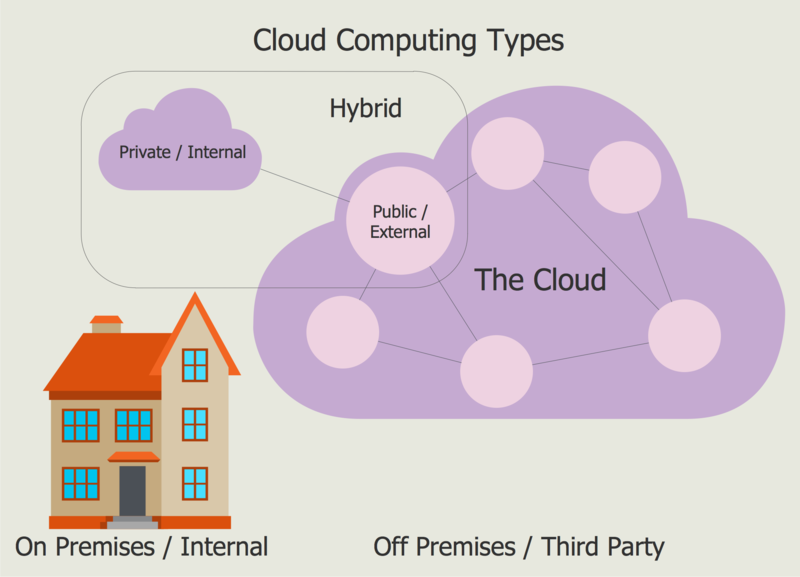 Hybrid - combines both public and private cloud models. Software as a service (SaaS) - which offer a complete ready-to-use application. 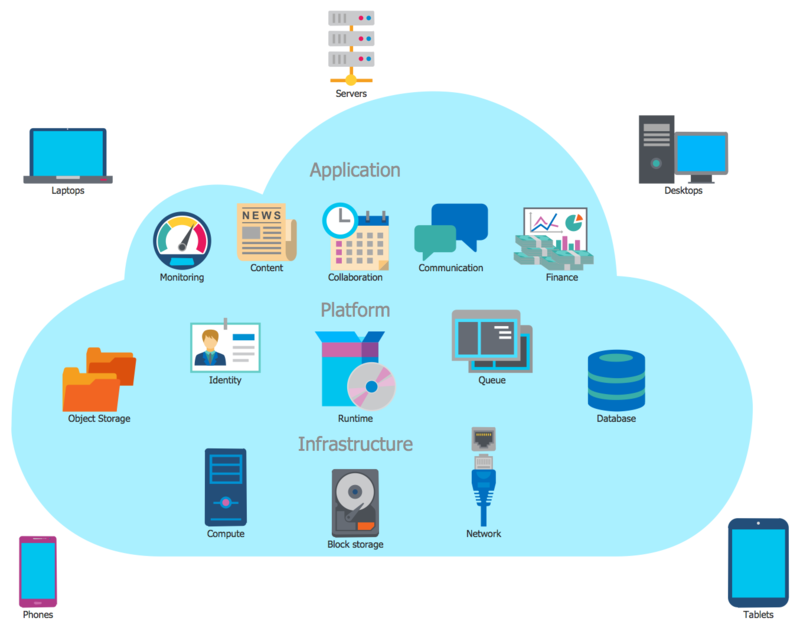 The best way to visualize the introduction to Cloud computing architecture is to create diagrams and schematics representing what is a cloud computing and how it works. For their design, we recommend to use a powerful ConceptDraw DIAGRAM diagramming and vector drawing software supplied with Cloud Computing Diagrams solution from the Computers and Network area of ConceptDraw Solution Park. Cloud Computing Diagrams Solution provides for your choice wide variety of useful drawing tools, 4 libraries with a number of various ready-to-use vector icons, objects and colorful clipart, and also collection of professionally designed samples and examples which can become a beautiful source of inspiration for you. All libraries objects are vector, so you can resize them without loss of quality, change their color to make your diagrams and charts more interesting, bright and attractive. All samples are available at your disposal at ConceptDraw STORE, you can apply them as is, or open in ConceptDraw DIAGRAM to change some details and then successfully use them at your work and science activity. The diagrams you see on this page were created in ConceptDraw DIAGRAM software using the tools of Cloud Computing Diagrams Solution for ConceptDraw Solution Park. 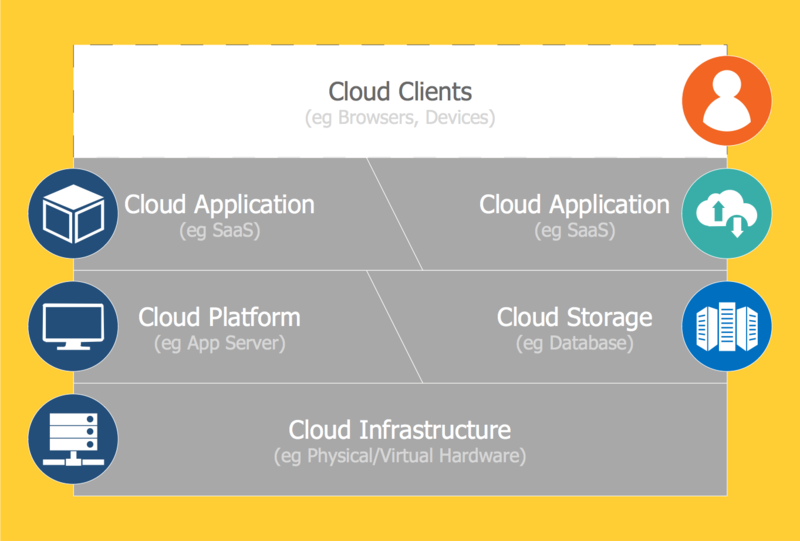 They are the good introduction to Cloud computing architecture. An experienced user spent 5-10 minutes creating each of them. Use the Cloud Computing Diagrams Solution for ConceptDraw DIAGRAM software to create your own professional looking Cloud Computing Architecture diagrams and schemes quick, easy and effective.